The tunnel is made up of 14 immersed tube units, each 100 metres long and weighing 7,800 tonnes. 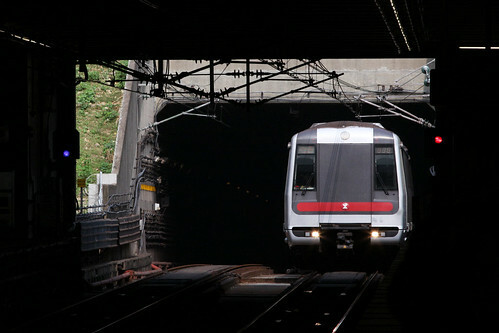 The tunnel was built on a 2800 metre radius curve due to the railway running north-south in Kowloon and east-west on Hong Kong Island. Each binocular section was constructed of concrete reinforced with longitudinal prestressing, in a casting basin at Chai Wan on north-east Hong Kong Island. The units were placed on a screeded gravel mattress foundation, with the final closure joint between unit No. 12 and No. 13 achieved underwater using tremie concrete. The Eastern Harbour Crossing carries both road and rail traffic across Victoria Harbour, in five separate immersed tubes. Each of the 15 precast reinforced concrete units are 128 metres long, and at 35.45 metres were the widest concrete tunnel sections built in the world up until that time. They were cast in three batches of five at a 5.5 hectare dry dock at Cha Kwo Ling, on the northern shore of the tunnel. Options for combining the tunnel with the Western Harbour Crossing vehicular tunnel were considered at feasibility stage of both projects, but the alignment constraints resulted in two separate tunnels being constructed. The ten tunnel units are of twin-cell prestressed concrete construction, each being 126 metres long. They were fabricated in three batches of 4, 2 and 4 units respectively, in the Shek O casting basin. Due to the railway running north-south on the Kowloon side and east-west on Hong Kong Island, the alignment follows a 60° curve: tunnel units are a mix of straight, transition curves, and minimum 850 metre radius. At the Hong Kong landfall is a special tapered unit, to accommodate the turnouts towards the separate Airport Express and Tung Chung Line platforms at Hong Kong station. The eleven pre-cast concrete tunnel units are being cast at the former Shek O Quarry, and are each approximately 160-metre long and 23,000 tonnes in weight. This entry was posted in Transport and tagged Airport Railway, construction, Hong Kong, Mass Transit Railway, MTR, tunnels, Victoria Harbour. Bookmark the permalink.